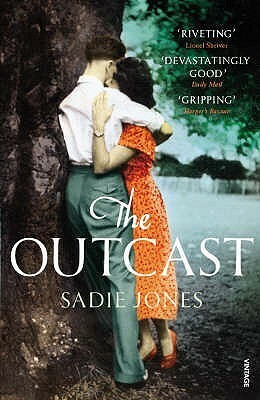 As I wrote earlier The Outcast by Sadie Jones is a book that has sat unread on my shelves for seven years until I noticed that it was being broadcast as a TV drama. I read half the book before the first episode and finished it before the second episode was broadcast. 1957, and Lewis Aldridge is travelling back to his home in the South of England. He is straight out of jail and nineteen years old. His return will trigger the implosion not just of his family, but of a whole community. A decade earlier, his father’s homecoming casts a different shape. The war is over and Gilbert has recently been demobbed. He reverts easily to suburban life – cocktails at six thirty, church on Sundays – but his wife and young son resist the stuffy routine. Lewis and his mother escape to the woods for picnics, just as they did in wartime days. Nobody is surprised that Gilbert’s wife counters convention, but they are all shocked when, after one of their jaunts, Lewis comes back without her. Not far away, Kit Carmichael keeps watch. She has always understood more than most, not least from what she has been dealt by her own father’s hand. Lewis’s grief and burgeoning rage are all too plain, and Kit makes a private vow to help. But in her attempts to set them both free, she fails to predict the painful and horrifying secrets that must first be forced into the open. As menacing as it is beautiful, The Outcast is a devastating portrait of small-town hypocrisy from an astonishing new voice. The TV adaptation, also written by Sadie Jones is faithful to the book, so for once I could enjoy them both – although maybe enjoy isn’t quite the right word. The TV drama is, of course a condensed version and whilst the cast was good the characters didn’t, of course, match up to my mental image of them whilst reading the book. I thought the boy (Finn Elliot) playing the young Lewis was excellent, whereas the adult Lewis (George MacKay) just didn’t seem to be right physically in episode one. However, he was much more convincing in the second episode. Overall, the themes of the book and the drama are relentlessly depressing, in post-war Britain, the men all maintaining a stiff upper lip, emotions securely repressed. Lewis witnessing his mother’s drowning is unable to express his grief and things just go from bad to worse as he resorts to self-harm. Meanwhile, the Carmichael family, not fully portrayed in episode one, have a secret, again closely guarded in a world where child abuse is just not acknowledged. In episode two the secret comes out in a dramatic scene, which I thought was really well done. Nathaniel Parker as Dicky Carmichael made a terrifying bully and Jessica Barden as the teenager, Kit was impressive. The book is written in the passive 3rd person narrative, which I wasn’t keen on. I didn’t like most of the characters, I didn’t like what happened to them and I’m not sure the ending is believable – it left me wondering what really happened next. But the descriptive passages are good, the characters of Lewis and Kit are well-defined, emotions are racked up high and it is truly tragic. I’m glad I read the book before watching the drama – and I’m glad I watched it, the scenery is beautiful and the repressed and yet emotional atmosphere came over better than in the book. I did have to watch behind my fingers at some scenes, which I was able to read without visualising them completely, but when it’s there in front of you on the screen it’s not so easy to cast a blind eye. Although you get an insight into Lewis’ mind and feelings when you read a description of him cutting his arm, it’s not as real as seeing it happen. So, a powerful story, which compelled me to read on and also to watch. This was Sadie Jones’ debut novel. She has since written Small Wars (2009), The Uninvited Guests (2012) and Fallout (2014). I have Small Wars amongst my TBRs – I must dig that one out soon. Reading challenges: Mount TBR 2015 and the Historical Fiction Reading Challenge 2015. I have to admit we decided not to see the second episode. It was well acted, I too thought the little boy was terrific, but oh dear… *so* – as you put it – relentlessly depressing. To tell the truth I feel like a bit of a wimp! I too didn’t watch the second episode, although I quite enjoyed the first (OK, maybe not right word, but was intrigued by and thought it was well done). I realise now that I’ve read Sadie Jones’ second book ‘Small Wars’ about Cyprus – and it was excellent, really liked it. I can see that I’ll have to read Small Wars sooner rather than later – glad you really liked it.